Clad in armor and armbands that feature dragon-like talons, a once-elusive Dragon Rider concealed her identity beneath an intricate mask with horns and tusks that resemble the Bewilderbeast she once commanded. When Hiccup and Toothless first came across this mysterious figure, she believed that they were allied with Drago and intended to interrogate them. However, noticing a scar on Hiccup’s chin, she recognized him and revealed that she was Hiccup’s long-lost mother. Once believed to have been swept up and killed by dragons, Valka was instead taken to the Dragon Sanctuary. Already somewhat sympathetic to dragons and keen on forging peace between them and Vikings, Valka realized that she could help these winged creatures more if she remained with them. While she was devastated at the thought of abandoning her husband and son, she believed that neither they nor the Vikings of Berk would ever be able to trust dragons enough to befriend them. 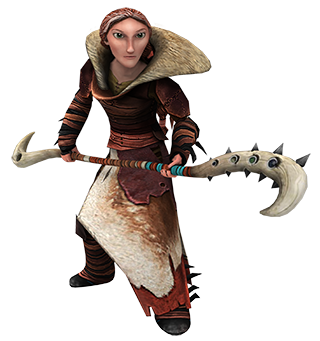 As such, Valka devoted her life to stopping dragon hunters like Drago and caring for dragons. She was even able to gain the trust of the Bewilderbeast, the Alpha of the Dragon Sanctuary. After years of isolation from other people, Valka may come off as a little awkward, but once you get to know her, she is strong and uncompromising, and is always willing to stand up for those who are helpless. Because of her many years amongst dragons, Valka has been a great help to students at the School of Dragons. 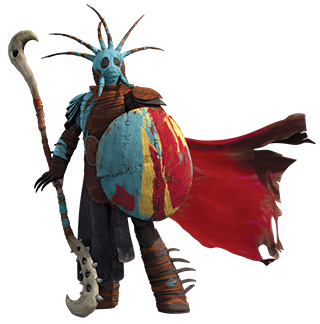 If you’re seeking out Valka’s wisdom, you can most likely find her in Berk, near the Great Hall, so be sure to stop by and say hello! She knows a lot about Viking legends and lore, such as the tragic tale of the Valkyrie and her lost love. Of course, she’s also sure to have some amazing dragon training tips up her sleeve! There is no one in Berk who knows more about dragons than her, and Odin help anyone who harms a dragon in Valka’s presence, for they may find themselves on the wrong end of her staff… and her wrath. After being reunited with Hiccup and Stoick, Valka was thrilled to learn that her family was not only willing to forgive her for leaving so many years ago, but also that the Vikings of Berk have willingly lived alongside dragons in peace for years. Unfortunately, her family reunion was cut short when Toothless, under the control of Drago’s Bewilderbeast, killed Stoick. While devastated, Valka was a source of comfort to Hiccup and even helped him defeat Drago. After the battle, Valka agreed to move to Berk along with her dragons from the Sanctuary to be with her son and future daughter-in-law, Astrid. 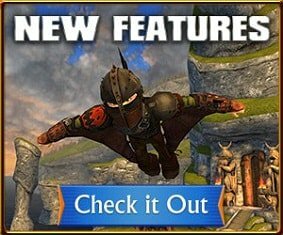 The newcomer - Hiccup’s mother, that is - is an interesting woman to be sure. A woman who chose humanity over savagery. Only, it was dragons that were human, and the humans that were savages. Of course, the Hairy Hooligans did not have a reason to trust the dragons until Hiccup and Toothless proved us wrong. Years ago, Valka left, believing that it was impossible for any of us to find peace between the two respective species. She left her family to form a new one amongst the dragons… and Hiccup forgave her. I won’t presume to know much about Haddock family affairs, but that I find quite peculiar. But perhaps Hiccup has inherited his mother’s compassion and understanding. So we must see her every day. She stands outside the Great Hall, offering her wisdom to all those who need it. And I cannot doubt that she is by far cleverer than most so-called dragon experts, and she is not as wild as one would expect of someone who has spent over a decade with dragons. In fact, Valka has been a great help to Berk and the School of Dragons. It is because of her wisdom that I cannot fault her for her choices. She has been a great help to our village and the school. I hope you can speak with her one day. Never in my life have I seen a Viking so devoted to dragons. I would even go so far to say that her devotion rivals that of Hiccup’s – And that’s saying something!